Here's a little Focker news from Moviehole...We won’t be meeting the diaper-staining Focker kids until next December. The Hollywood Reporter says Universal has opted to push “Little Fockers”, the third in the popular Ben Stiller-starring series from July 30 to December 22. With “Meet the Fockers” doing huge business when it was released Dec 22, 2004, the move is likely only going to be good for business. Into the July 30 slot, previously occupied by “Fockers”, goes the Matt Damon thriller “The Adjustment Bureau”. Uni has also bought forward "Scott Pilgrim vs. the World" to Aug. 13. On Dec 22, “Fockers” will be going head-to-head with “The Green Hornet” starring Seth Rogen, “Gulliver’s Travels” with Jack Black and Emily Blunt, and the Coen Bros’ remake of the classic “True Grit”. Here's a very cool story courtesy of IESB. Kevin Williamson finally starts to dish the goods about Scream 4...why it won't be in 3D, and why Neve Campbell may be the opening kill!At the helm of both film and television, Kevin Williamson has established himself in Hollywood as a visionary whose success created immediate attention. He has garnered respect, not just as a writer, but also as a producer and director whose visions have resulted in some of the most lucrative franchise vehicles ever made. His first foray into television was the series Dawson's Creek, a show that instantly became a pop culture phenomenon and launched then-unknown actors James Van Der Beek, Katie Holmes, Joshua Jackson and Michelle Williams into instant stardom. The L.A. Times is reporting that director Guy Ritchie will be back in the chair for Sherlock Holmes 2..."Sherlock Holmes" played second fiddle to the aliens of "Avatar" at the box office, but the Victorian Age sleuth just beat out another extraterrestrial -- director Guy Ritchie has set aside the planned "Lobo" film to clear his schedule for a fast-tracked "Holmes" sequel, according to producer Joel Silver. "Holmes" has pulled in $389 million in worldwide box office since its Christmas Day release and looks to add to that with overseas releases still pending in Germany, Japan, France and several other markets. The role of the famed literary detective also just earned Robert Downey Jr. a surprise Golden Globe, suggesting that the actor might still be in play for an Oscar nomination next week. Does every movie with a "3" in the title have to be 3D nowadays? Ugh. This saddening news comes from MarketSaw...Jim here. 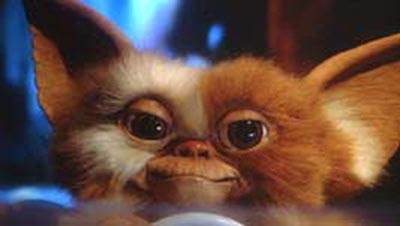 Speaking of combining horror with comedy (GHOSTBUSTERS 3D), up comes another prime example of that genre - GREMLINS. Again I have very good information from a top source that tells me another GREMLINS movie is coming to the silver screens and it will be in stereoscopic 3D! It is in the early stages with still lots of hurdles to pass, but it is being developed. This is not a 3D conversion of the original to be clear. Paranormal Activity 2 is on! Here's some interesting news coming from THR...the Paranormal Activity sequel is rolling...but is it too soon?Something’s moving in the “Paranormal Activity 2” house. Paramount has hired screenwriter Michael R. Perry and director Kevin Greutert to create the sequel to 2009’s biggest surprise hit, “Paranormal Activity,” which scared up $151 million in worldwide grosses in the fall on a shoestring $15,000 budget and a shrewd, opt-in Web marketing campaign. Significantly, Paramount will unleash it in theaters on the pre-Halloween weekend of October 22, which sets it against that date’s reigning champion in previous years, the next installment in Lionsgate’s “Saw” series (this year would be “VII”). In a symbolic twist, Greutert made his directorial debut on the sixth “Saw” film, which grossed just $31 million worldwide, with observers thinking that the franchise may be bleeding dry. This is what bruce Campbell told AICN about the sequel to My Name Is Bruce...Hello everyone. Bruce Campbell here. This urgent message is short, because my keystrokes are monitored and I fear for my life. My partner at Dark Horse comics, Mike Richardson (normally a very rational and talented man), threatened to have his foot soldiers "crush my spleen" if I did what I am about to do. But the fans deserve to know, so with great trepidation I officially announce Bruce Vs. Frankenstein, the sequel to My Name is Bruce. Principal photography begins this fall in Oregon. I'd like to live long enough to see the cameras roll, so please, for the love of God, do not tell anyone - I can't risk this announcement getting back to Mike! Thank you. Wes Craven confirmed for Scream 4...right? He's in, he's out, he's in...and he's out again. What the hell is going with Wes Craven and Scream 4? My thoughts: he'll be back. Here's what b-D is saying...Ok, I thought this was already reported 90 times, but maybe I'm wrong. In an interview with MTV, star David Arquette confirmed that Wes Craven will in fact be getting behind the camera for Scream IV, assuming it actually happens (I don't have a lot of faith in Dimension Films these days). "Yes, Wes [Craven] is in, Neve [Campbell] is in, everyone is in," Arquette said. The lovely Cox didn't sound as sure however. "I know they're trying to make that work," she said, referring to bringing the "Nightmare on Elm Street" creator back on to direct. "They'll make it work," she said, quickly adding "I hope." There you go, back at square one. I'd love to interview someone and talk in circles. Teresa Palmer as been cast in the latest installment of the Mad Max films...this comes from The Herald Sun...ACTRESS Teresa Palmer is to play a leading role in George Miller's hugely anticipated fourth Mad Max film Fury Road after her co-star in The Sorcerer's Apprentice spilt the beans in Los Angeles yesterday. Palmer's Sydney agency Shanahan's would not comment on the casting yesterday, nor would production house Kennedy Miller. But actor Jay Baruchel told reporters interviewing him for the new Dreamworks film How To Train Your Dragon that Palmer, who splits her time between Australia and Hollywood, was preparing for a gruelling shoot on the new Mad Max episode. "She gets to work with him, and she's [going to be] doing Mad Max 4 with Miller," he said. The actor, who counts Palmer as a very good friend after working with her on the Sorcerer film, said he didn't know the character's exact name but believed it was the female lead. Todd Farmer has posted quite a lengthy blog entry about the rise and fall of Halloween 3D. Check it out. There's really no surprise here, Iron Man 2 will be shown on IMAX screens across the country. Does this mean the film was actually shot in IMAX? Probably not ala Star Trek. This really bugs me as it seems to just be a subtle ploy to bring in more money..."let's charge $5 more a ticket to show it on a 10-story screen." Ugh. C'mon! Atleast shoot the damn thing in IMAX. The Dark Knight did it right!This comes from EW.com...Iron Man 2 just got even bigger. The highly anticipated sequel will be simultaneously released on IMAX screens on May 7, Paramount Pictures, Marvel Entertainment, and IMAX Corporation jointly announced today. “We’re excited that the IMAX format will offer fans an even more immersive way to experience the sequel,” said Marvel Studios chief operating officer Tim Connors. Some pretty big news came today for all things Jurassic Park with the unofficial announcement of not only a fourth film, but a FIFTH and SIXTH! Read on for the skinny from Boxoffice.com...The internet is freaking out that there might be a Jurassic Park IV. Wow, when did that happen? November—you mentioned to Ain't it Cool News that there might be a good script. Did I tell him? Was it me? You said that there was no way to get people back on the island for a fourth time and have it make sense, but that 2001 was the last installment and we're due. Well, there is going to be a Jurassic Park IV. And it's going to be unlike anything you've seen. It breaks away from the first three—it's essentially the beginning of the second Jurassic Park trilogy. It's going to be done in a completely different way. That's pretty much all I can tell you. If you think of the first three as a trilogy, number four would be the beginning of a second trilogy. Ivan Reitman directing Ghostbusters 3!!! MTV has the exclusive...Ivan Reitman, director of the first two Ghostbusters returns for the third!A few weeks ago, "Ghostbusters" writer and star Harold Ramis revealed that the long-awaited third movie in the series is planned for a 2011 release. This news broke only a short time after "Avatar" star Sigourney Weaver speculated that Bill Murray's character Pete Venkman might appear in the movie as a slimer ghost, and that Oscar, her character's son from the second movie, would be a full-fledged Ghostbuster. The idea for a fourth Mighty Ducks film has been floating around since the 90s, but Moviehole finally put to rest the rumors. Besides, what's a Duck film without Emilio Estevez and Joshua Jackson?Though there was a loose plan to relaunch the series, with producer Jordan Kerner (“Charlotte’s Web”) telling Moviehole a couple of years ago he was in talks with (his former stomping ground) Disney to do a possible fourth installment in the series, a Disney insider tells us “there are no current plans for a fourth Mighty Ducks. The higher’s up weren’t interested”. So it's no surprise now that Sam Raimi and Tobey Maquire have exited the fourth Spider-Man film. So what does this mean for the series? And what exactly will happen with The Vulture, now that it has been confirmed that John Malkovich has signed on? There are so many questions that need to be answered -- and quite frankly, I don't think Sony cares all that much. They seem to be on the reboot bandwagon now...and actually, this just may work for the next Spidey film. Maybe a film in the tradition of Batman Begins, and along the lines of James Cameron's original Spider-Man idea that was a much darker film. Hopefully some updates start rolling in so we can get a feel for what's coming. Hopefully a solid director and new leading man can save this franchise. The fourth chapter in the Resident Evil has shifted gears just a bit -- actually, just the release date has changed. Thanks to Bloody-Disgusting for the heads up!Sony Screen Gems has shifted Resident Evil: Afterlife 3D back to September of this year after being pushed back to 2011 last month. The studio announced that Alice will be back in action on September 10, 2010, two weeks earlier than originally planned! Directed by Paul W.S. Anderson, in a world ravaged by a virus infection, turning its victims into the Undead, Alice (Milla Jovovich), continues on her journey to find survivors and lead them to safety. Her deadly battle with the Umbrella Corporation reaches new heights, but Alice gets some unexpected help from an old friend. A new lead that promises a safe haven from the Undead leads them to Los Angeles, but when they arrive the city is overrun by thousands of Undead and Alice and her comrades are about to step into a deadly trap. Not only is John Malkovich set to be in Spider-Man 4, but he also confirmed that he is playing "The Vulture", the film's main villain.This is what BadTaste had to report...Host Simona Ventura asked Malkovich about his role of Vulture in the movie, he not only didn't deny his involvement, but confirmed that he's waiting for the final script to be sent to him, and that the movie has been delayed. He also hopes that shooting will begin as soon as possible. This comes from IESB in an exclusive interview, it appears that Amanda Seyfried will not be in Momma Mia 2...and why...because the film is set to be a prequel. So this also means that Maryl Streep probably won't return either...Amanda Seyfried confirmed to IESB that indeed Mamma Mia 2 will be a prequel and that it will focus on the younger years of Donna, Meryl Streeps character. Seyfried said she would not be returning obviously because of the nature of the story, there is no room for her. Most likely this also negates Streep's involvement as well since it will focus on her as a young woman. Seyfried said that although they would all love to return, because of the story, it's just not plausible. Coming from MTV...it seems that the idea that George Lucas has for Indiana Jones 5 is just a tad bit outrageous...The beauty of Indiana Jones is that we always imagine him as being on the verge of another great adventure. It's impossible to imagine Indy sitting back in his porch chair with a glass of lemonade, screaming at kids to get off his lawn. Now, Harrison Ford is eager to pick up the whip and fedora one more time and get "Indiana Jones 5" filmed while he's still a convincing action star. “I’ve had a meeting at the studio with Kathleen Kennedy about it,” Paxton said, whose inspiration for a sequel came as a result of a trip that he took to the Ozark Mountains last spring. According to IESB, G.I. Joe 2 is going to have two writers...Rhett Reese and Paul Wernick have been in the news this week when it was announced they had officially signed on to pen DEADPOOL for 20th Century Fox. IESB has exclusively learned that not only are these two writing the script for the Merc with the Mouth, they've also just been handed the sequel to G.I. JOE: THE RISE OF COBRA that hit theaters this past August with Stephen Sommers at the helm. We've reached out to Paramount and WME and are awaiting further comment. RISE OF COBRA was a big summer success released in theaters August 7 and grossing over $300 million in worldwide box office receipts alone as well as a ton of money in DVD and toy/merchandise sales. Reese and Wernick are most known for their work on the Sony Pictures' horror hit ZOMBIELAND that starred Woody Harrelson and grossed just under $100 million worldwide. This comes from Production Weekly via Twitter...John Whitesell will return to direct the 2nd sequel to "Big Momma's House," production is scheduled to begin mid-April in Atlanta. Variety is reporting that the writers of Zombieland have been tapped tapped to write the X-Men spinoff Deadpool, starring Ryan Reynolds.20th Century Fox is making progress with its "X-Men" spinoff, "Deadpool," and has tapped "Zombieland" scribes Rhett Reese and Paul Wernick to pen the screenplay. Ryan Reynolds will reprise his role as the wisecracking mercenary he portrayed in last year's "X-Men Origins: Wolverine." There is no timetable on the Marvel property, though Reynolds has a window after wrapping the "Green Lantern" this summer. Reynolds has been bulking up to play the DC Comics' hero "Green Lantern," which starts lensing next month. This means he would already be in superhero shape if the script for "Deadpool" is ready by summer. Reese and Wernick, who wrote "Zombieland," will stay true to the mythology of "Deadpool" given that Reynolds is a huge fan and protector of the property. The submitted speculation screenplay for Spider-Man 4 has been rejected by the studio. Now normally this is no big deal, scripts get rejected all the time...especially first drafts and specs -- but when there's a certain Spidey in the title, it tends to be bigger news. Thanks to EW for the scoop...Our Spidey sense is tingling. Just a few months ago, Tobey Maguire told us he was ready to don the Spider-Man suit again in March for the film's fourth installment, which was looking at a May 2011 release. Now it looks like Spider-Man 4 is facing a foe worse than Doc Ock: a rejected screenplay. Somewhere along the line, Marvel's record-breaking franchise hit a huge snag, reports Hollywood insider Nikki Finke. Director Sam Raimi is reportedly dissatisfied with the Spider-Man 4 script thus far, and without a script, filming on the long-awaited movie has been put on the back burner. So Death Race 2 is going to straight to DVD (go figure). And here's what's happening so far...Moviehole can reveal that Luke Goss will star in Universal's direct-to-DVD sequel to 2008s "Death Race". In director Roel Reiné's "Death Race : Frankenstein Lives", Goss ("Blade II", "Hellboy II : The Golden Army") plays Luke, the young man that donned the 'Frankenstein' mask prior to Jensen Ames (Jason Statham's character in Paul W.S Anderson's "Death Race"). Luke, the right-hand man for a notorious mobster, is busted for killing a cop in the process of robbing a bank. Once behind the bars of Terminal Island, the confident newcomer is roped into entering the 'big race' by it's green-eyed producer. The project reunites Goss with Universal, whom he worked with on "Hellboy II : The Golden Army". "Frankenstein Lives", Written by Tony Giglio, begins shooting in Eastern Europe next month. It appears that the remake of Dune is back on track as it has found a director to take the helm. Thanks to Entertainment Weekly for the tip...Paramount has found a new director for its remake of the sci-fi classic Dune, after Peter Berg dropped off the project in October. The studio has hired Taken helmer Pierre Morel to oversee the movie. Paramount is currently looking for a new writer to incorporate Morel’s vision of the project into the original draft by Quantum of Solace scribe Josh Zetumer. Morel plans to make a very faithful adaptation of the 1965 book by Frank Herbert. The movie is a high priority for Paramount’s production chief Adam Goodman. Kevin Misher and Richard Rubinstein are producing. It appears that Michael Cera (Superbad, Nick & Norah's Infinite Playlist) wants a role in the third Ghostbusters film...playing Oscar, Sigourney Weaver's son. This is what Cera had to say to People Magazine. (I loved) Ghostbusters! As a kid, I wanted to be Bill Murray's character. Harold told me lots of stories and I memorized every word.Personally, I think the kid could pull it off -- and I think it's highly likely that he'll be considered for the role. Interested in what's happening with the prequel to John Carpenter's 1982 remake of The Thing? Well read on to see what Moviehole ran earlier...Anyone’s that been in viewing distance of my horror tower (yes, I have categorized DVD shelves at home) knows just how much of a woody I have for John Carpenter. There’s more shelf-space dedicated to the man there, than there is, well, cobwebs – and that’s saying something; ask my underpaid but under-performing cleane - and David Lynch (er, maybe). Be it “Halloween”, “The Thing”, “Big Trouble in Little China”, “Christine”, or “They Live” Carpenter’s proved time and time again what a fantastic writer, filmmaker, composer (his “Big Trouble” theme is a corker!) and, dare I say it, entrepreneur he is. I guess you could say Carpenter is my era’s Robert Rodriguez – a man with enough creativity and skills that Hollywood doesn’t mind if he goes against the grain now and then; even getting paid for his rebellious nature. This comes from the always entertaining Bloody-Disgusting...With Green hot on the heels of production of HATCHET 2, the writer-director reflects back on some of the HATCHET woes.